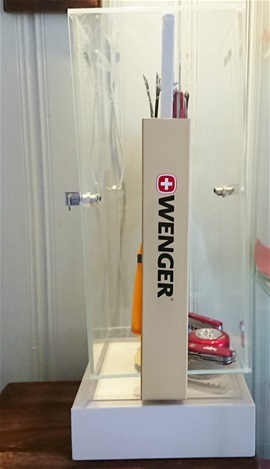 I got this very nice Wenger display holder with a nice poster from my favorite knife shop. I am very grateful for this and I will take care of it. It is still a bit sad that Wenger SAKs are gone. It is nice that Victorinox continues many of the products made from the former Wenger factory. I am also very glad that the new brand Swiza knives are doing so well and with much experience from the former Wenger Company. I like to collect some advertising products from here and there. I have managed to find several items made to be used for advertising and display. The one today is used more for showing the products and Brand name. Used for display purposes at knife stands and shops. I got this for free and it will be placed on a shelf at my place. Over the years I have come to know several collectors in the world and items like this are getting interesting for enthusiasts and collectors. That is a good thing and it would be too bad if something like this was forgotten. I miss the Wenger knives but life goes on and new knives see light. This item today is made in a plastic material but heavy compared to other similar frames from the internet. 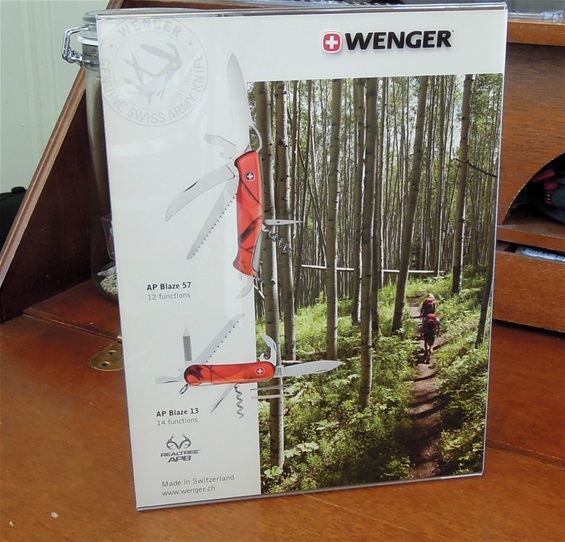 It also got the Wenger name on the plastic holder itself free from the poster. 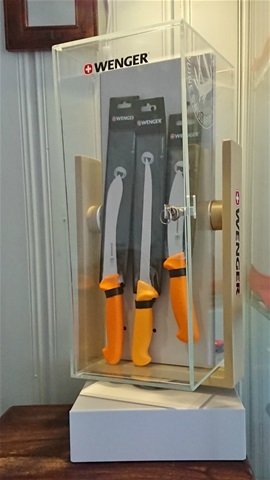 This has been on display showing the Wenger knives and products for years. The shop is called Jakt og Friluft and it is located in my area where I live. This shop got the best service I have ever experienced and they have knowledge too. I can also mention that when i was at this shop today they mentioned that Swiss knives will again be sold there. It will be Victorinox and Swiza knives and that is good news for us. I do not know what models yet and they mentioned it is going to be at autumn or so. The time is a bit uncertain yet. Jeg kan nevne at det ble nevnt at kniver fra Sveits vil igjen bli solgt der. Det vil bli Victorinox og Swiza kniver og dette er gode nyheter. Jeg vet ikke hvilken modeller enda men det vil være omkring høsten eller nærmeste tid. 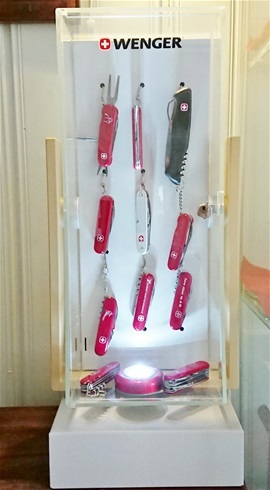 Wenger had several types of display cabinets made at different places, here is one that i have with Wenger Swiss Army Knives that I placed in. It is sturdy made that can turn by hand. It is possible to install a motor under it. This same display cabinet was also made with a motor. It got a metal divider in the middle for magnets that follow in the box. I made some hooks because I found it easier. The cabinet or display also got lockable doors. In a store i found a small light that I placed in the bottom. This display is very well made and it got an original angle so if you put a motor on it will give very interesting display ability. The whole construction is made of metal and strong plastic material. It is fun sometimes to display knives and alter the collection in it. The magnets that came with this display are strong and more than enough to hold SAKs. I was lucky to get this display from a friend. On this side i have some Swibo knives.....It can turn around 360 degrees.. If you place a motor on it then it is best with magnets for the SAKs. The display is made with metal for the divider, the holder on the sides and the stand so it got some weight. Here is a self-made display that i made from parts. I found a box that I am not sure what was used for. It is made of a nice see-through plastic and some kind of thin metal frame. 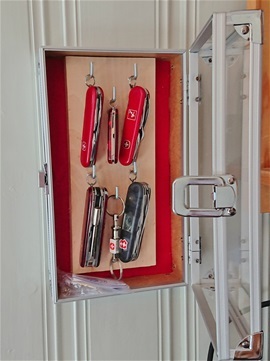 I used a red background and I took a piece of wood that I attached to the bottom of the box and put on some hangers for the SAKs made of metal. It only requires one screw on the wall so it saves the wall from unnecessary damage. 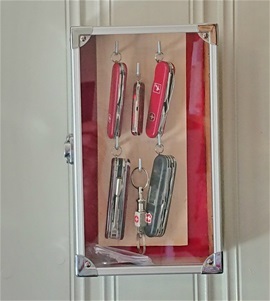 This display can be used for keys or for some Swiss Army Knives that I collected with both Victorinox and Wenger products. I can also use it for EDC rotations if I want. The wood piece will also strengthen the box. Usually i do not hang SAKs on the wall but some is nice. It is very reflective for the camera, it is very nice in reality.